Harold Roney (1889-1986) was born in Sullivan, Illinois in 1899. His artistic training began at the Chicago Art Academy for a period of one year and was followed by training at the Art Institute of Chicago for three years. After working for a period as an art teacher in South Bend, Illinois, he moved to Houston in 1925, and moved again after three years to the Boerne hill country outside San Antonio. Although most of his life was spent in Texas, the state that he is closest identified with, he did spend several years during the 1930s training in New Hope, Pennsylvania with John Folinsbee and Harry Leith Ross. He received further training from Texas artists Harry A. DeYoung, Dawson Dawson-Watson, Jose Arpa and Paul Schuman. 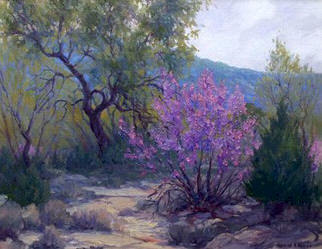 He was a landscape painter of merit, and never failed to enjoy painting the Texas Hill Country. A colorist of note, he primarily painted in oil with brush or palette knife. He was also known as "The Cloud Master." Harold Roney was a member of the Leon Springs Art Colony in the 1950's just outside of San Antonio and had a studio there where he painted and taught art. He exhibited at the Southern States Art League; The Annual Texas Artists Exhibitions in Fort Worth; The San Antonio Annual Artists Exhibition, San Antonio and many others. He also exhibited in numerous one-man shows. His work is in the collection of the Witte Museum in San Antonio, Texas; The Panhandle Plains Museum in Canyon, Texas; The Austin Art League and others.